The authors explain the Advanced Persistent Threats (APT) phenomenon in the context of the legal and technical one perspectives. The APT definition is juxtaposed with the legal term of armed attack. Legal reflections are concentrated on the characteristics of the APT and try to explain whether this category is sufficiently unambiguous and consistent to serve as a powerful argument in legal analysis, which is especially important to the decision-makers in the context of self defence and the legality of a military response to a cyberattack. The technical perspective adds complexity to APT analysis due to the intrinsic characteristics of the malware, and more generally of the cyberattack. Therefore, the authors argue, analysis cannot merely focus on the technical context, and they underline the necessity for integration with the geopolitical and military context in order to provide a more exhaustive view of the attack and to support the attribution process. Various efforts have been made to establish export controls and other mechanisms that would prevent illicit nuclear trade from occurring. These tools have been fairly successful in capturing illicit transactions of goods whose application is purely nuclear. The goods and technologies that can be used for both military and civilian purposes, the dual-use items, remain the key challenge. The legitimate market for such goods is enormous, but they also have applications in centrifuge, laser enrichment, reactor, and plutonium separation programmes. Iran and other proliferators have a long history of attempted procurements in this area, including items such as valves, frequency converters, carbon fibre, machine tools, and many others. The current non-proliferation regime has been slow to catch up with this reality. It is crucial to reverse this trend and adapt international standards, to provide a more holistic approach to countering nuclear proliferation. Polish Special Operations Forces have participated in missions abroad, for example, in Afghanistan. In the initial phase, special forces soldiers were assigned to the tasks that could be performed by conventional military units, such as protection of bases, but over time the situation changed. Their actions contributed to stabilising the situation in the region and indirectly resulted in increased international security. During the operations, soldiers released hostages and confiscated weapons. In this way they disrupted the opponent, because the losses incurred by terrorists led to the depreciation of the position of the leaders of the terrorist networks. In addition to special operations, soldiers were preparing “Afghani Tigers” officers to carry out activities independently, and to ensure safety after the coalition forces left the region. Cooperation of soldiers with the Afghan officers is the proof of success in building positive relationships. Implementation of special operations by special forces soldiers led to their gaining new experience, and to the modernisation of armaments and verification of procedures. The activities conducted proved that Polish special forces are a reliable partner. This paper is devoted to analysing the factual and potential influence of the International Criminal Court (ICC) in a conflict and post-conflict environment. It is argued that the ICC’s capacity has to be measured by its ability to tackle the “hard-cases,” both geopolitically and legally, and to serve as a real means of implementing transitional justice strategies applied by post-violence societies. The initial evaluation of the ICC’s capacity in the field of international and transitional justice is compared with the current situation in Ukraine, since Kyiv has lodged two ad hoc declarations under Article 12 (3) of the Rome Statute. The first accepted the jurisdiction of the ICC with reference to “Maidan crimes” that occurred during the winter of 2013 to 2014, and the second covers the possibility of crimes against humanity and war crimes committed in the course of warfare in the Donbas region. Undoubtedly, careful analysis of the ICC’s presence in the Ukrainian crisis is required. Since the Balkan Wars in the 1990s, Serbia has been perceived by Europe as its enfant terrible. This is an effect of Serbian war crimes, of an unwillingness to cooperate with the International Criminal Tribunal for the former Yugoslavia, and general reluctance towards Western political structures in Serbian society. The tension between the West and Serbia grew particularly high in 1999 during the NATO bombing of Yugoslavia, and in 2008 when Kosovo proclaimed independence. In spite of these tensions, within last few years Serbia has been successfully involved in a normalisation process with Kosovo as a part of its rapprochement with the EU. Serbia has opened itself to the West but it still maintains good relations with Russia, regardless of the Kremlin’s foreign policy activities. Hence, the author argues that rethinking relations and cutting certain ties with Russia should be among the key conditions for Serbia to join the EU, no less important than normalisation with Kosovo. More than a decade after EU accession, Poland, an initial enthusiast of euro adoption, has turned into merely an assertive endorser thereof, with the prospect of Polish entry to the eurozone vanishing over an uncertain political horizon for the foreseeable future. Although legally bound to adopt the euro, Poland has drawn on the indeterminacies built in to the Maastricht convergence criteria to effectively postpone eurozone entry. While the euro adoption initially constituted a predominantly legal challenge, today it is an essentially a political issue. 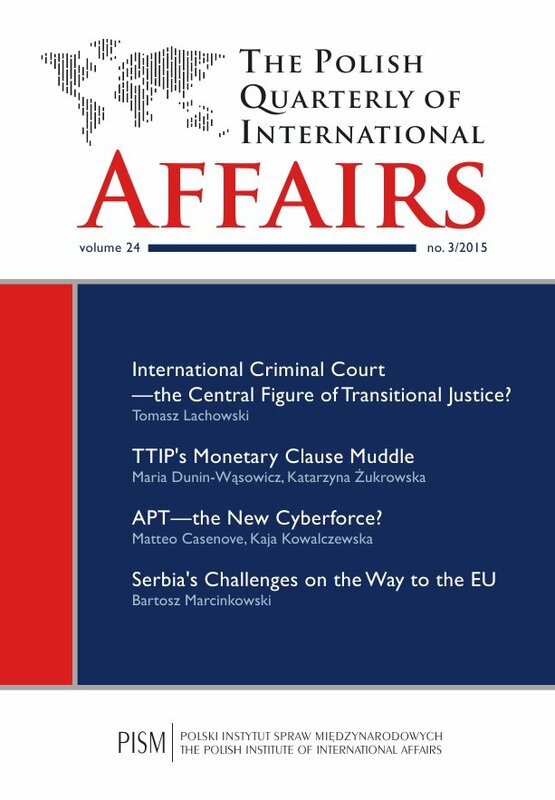 Moreover, as a result of the eurozone crisis, the debate on euro adoption switched from a sober cost-benefit analysis to a political risk (and cost) assessment, where the attainment of nominal and legal convergence has become a function of the Polish government’s broader domestic and European political strategy. The outcome of the presidential election in May 2015, described by commentators in terms of an epochal change, further blurs the prospect of Poland’s euro area membership. This paper considers the impact of British membership of the European Union (EU) on the development of an EU security policy through the Common Security and Defence Policy (CSDP), and on the security policy-making of the British state. It does this through utilising a framework of Europeanisation, whereby policy is both uploaded from the national level to the EU level, and reciprocally downloaded from the EU level to the national level. I argue that this has played a role in shaping British approaches to security policy, whilst ensuring that the CSDP has been clearly positioned to support, rather than supplant, NATO as the premier security organisation in Europe. The author delivers a perspective on the economic and foreign policy outlook for South Africa with respect to two events that determined the course of South African politics: the ANC conference in Mangaung and the 2014 general election. The motivation for this research is the importance of the ANC in relation to South African domestic politics and the foreign and economic policy, bearing in mind that the ANC has won all elections in South Africa since the end of Apartheid. The study is qualitative and the analysis is rooted in political realism, with the self-interest of individuals as the definitive factor. The author focused on factional tensions within the ANC and changes in South African political landscape. The key finding is that domestic politics in South Africa are more fragmented and polarised after the Mangaung conference. This is a result of the ANC abandoning nationalistic rhetoric. Nevertheless, the ANC’s supremacy in South African politics is unequivocal. South African economic policy will be directed towards business and foreign investors. Foreign policy will drift away from the “African solutions for African affairs” paradigm, and towards limited involvement. In the current global economic, climate South Africa will experience slow economic growth. We argue that TTIP negotiations, which are focused on improving conditions for mutual trade and investments between the U.S. and the EU, have overlooked the issue of the influence of monetary and exchange rate policies of both sides on the potential results of a prospective agreement. Thus we demonstrate that the agreement should have been supplemented by a monetary clause (MC) in order to avoid a possible mismatch between U.S. and EU currencies. Such a clause, and no other possible currency related legal instruments, should be broad, and aim to regulate the bond between the dollar and the euro. It can work as a convenient springboard to invigorate the multilateral trade system via the institutional nexus of the IMF, WTO, OECD or G-20. The clause can make the agreement as important for strategic relations between the U.S. and the EU as the Treaty of Rome was for the rise of European integration.